On the final Sunday of the expo we made our way back for one last seminar. 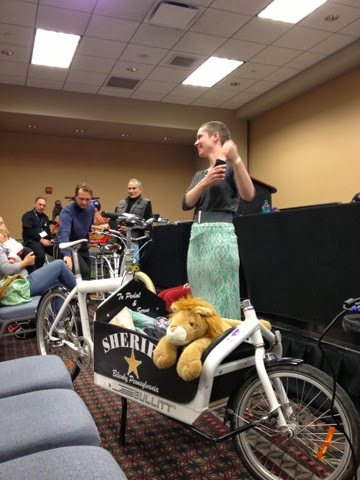 The fin event I wanted to be there for was the Women Bike PHL seminar led by Katie Monroe who started and leads the effort of the same name for the Bicycle Coalition. 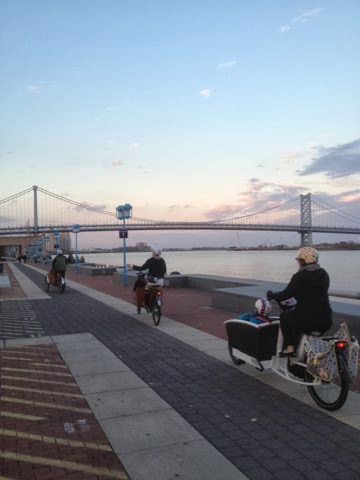 I took my favorite lady who bikes Philly with me. The panel included Shelly who owns Fairmount Bicycles, Georgina Terry of Terry/Heart of Steel Bicycles, Kristin Gavin who is the founder of Gearing Up and one of the programs graduates whose name is currently missing from my brain. 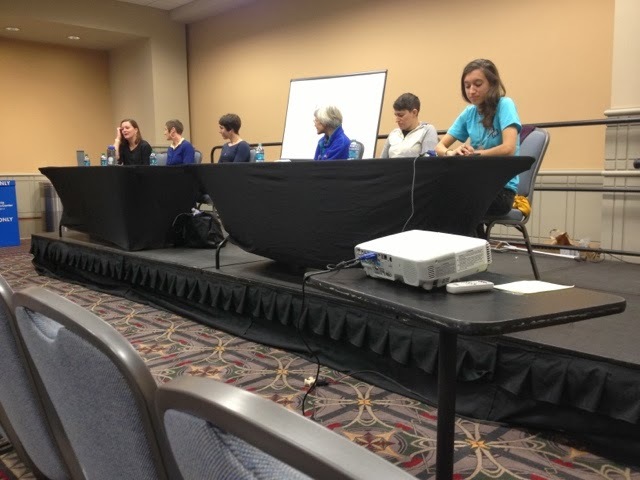 The panel focused on how to get more women biking both what individuals can do and what the industry can do. I think both the panel and audience worked well in a discussion together. The take away was to encourage a friend who is bike curious to go for a ride with you. 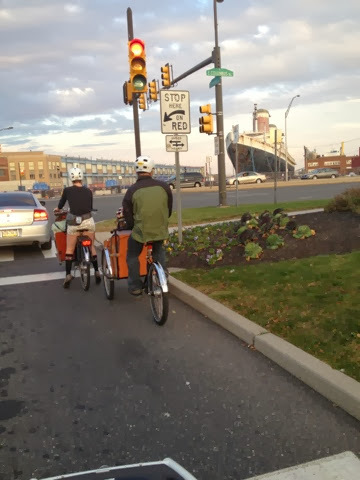 The panel also made a connection with another ride organizer here in Philly. 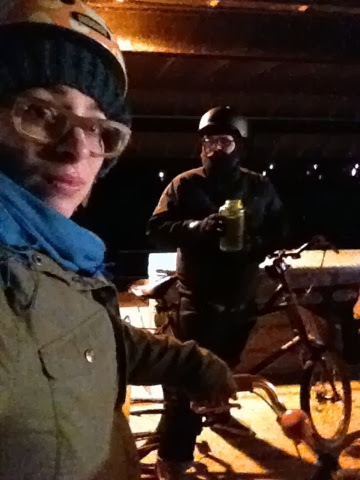 The female powerhouse behind the Naked Bike ride and Bike Party. Looks like she is going to join KMPHL's Holiday Light Ride to provide the tunes! Who did I ask to ride with me? Well I am asking you! 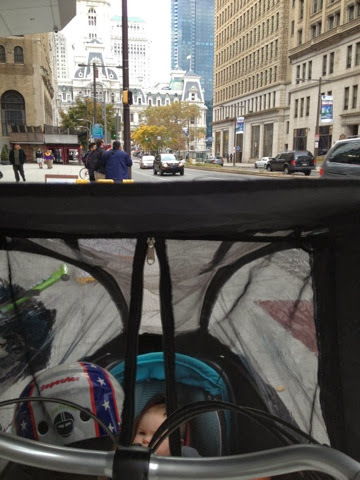 Moms (&families) biking Philly is a "hill" for me and my co- Kidical Mass organizer Marni. 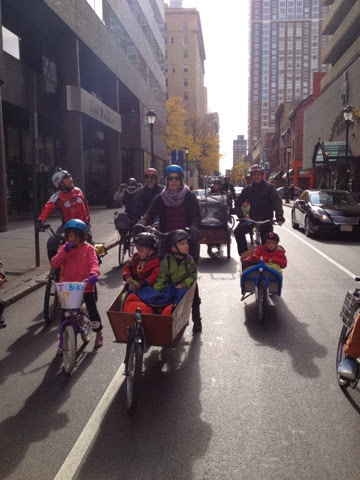 So we hope to take the friend for a ride a bit further and get more moms and dads and grandparents and YOU out to our Kidical Mass open house at Firth&Wilson in January. 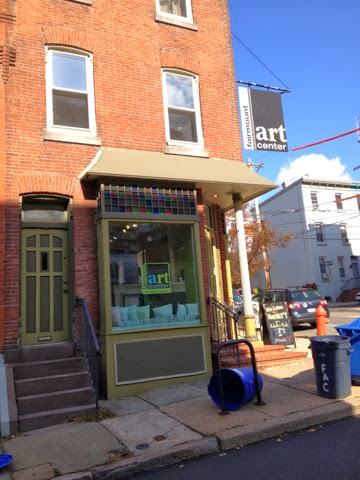 Friday's we now bike up to Fairmount for an art class for M. The art class' street happens to have three charming homes and art center on one side and the backside of the Art Museum's Pearlman building on the other. It is also a service entrance to the Pearlman where I have seen garbage trucks and FedEx pull in. And less then a couple of employees use the personnel gate to enter and exit. Trim back your plants if you want a wider side walk. 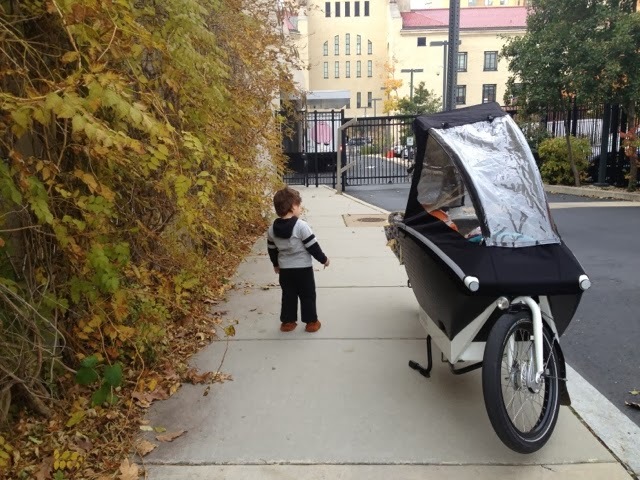 I park on the side of the Pearlman because the CITY sidewalk is larger then the side with the homes and can accommodate a wheel chair/stroller next to my bike if needed. I always keep wheel chairs and strollers in mind and choose not to block car doors if possible, I never block curb cuts and I do all this without being told. Today a security guard at first from the security of behind that iron gate in the picture above told me I couldn't park where I do. I was busy backing the bike into the spot and said what? He comes out and again saysI cannot park there. I ask if it is a city sidewalk he says "yes" and adds it is a staff entrance. I reply I leave plenty of room. He starts telling me to park at a "U" bike rack across the street but this would block access to the homes on the other side. He says here park here pointing to a pole on the side of the Pearlman building that blocks a car door and a curb cut. I tell him that. The U rack he told me to use. He asserts I cannot park there again I say again it is a city sidewalk, this is a bicycle I can legally park here. I smile and say this all very calmly, which you have to know is hilarious as I can be a fire-y lady. Then I say feel free to call the cops! I am at this point not moving. He then asks how long I will be, I say 1 hour and I parked here last week. "I know "they" complained" then he says this is a "museum". HOLD THE PHONE. This is a museum? I had just had no clue, you know since I happily promoted a bike event there this summer on this very blog. I am also a card carrying Alliance of American Museums member. Plus also I hold an MA in Museum Education. I almost lost it. How the elitism just spilled from that comment, how the "museum code" that not everyone is welcomed just made me even more determined to park there. I kept it together still the whole time asserting I am parking there and continued to lock my bike up. I told him come get me if someone complained. Luckily he didn't because that person would get an ear full. And trust me the customer service person who I'm about to call will also get an ear full. Dear Philadelphia Museum of Art who clearly cares less about bike visitors because your bike parking is subpar and you just spent a TON of money to build a parking garage for cars. 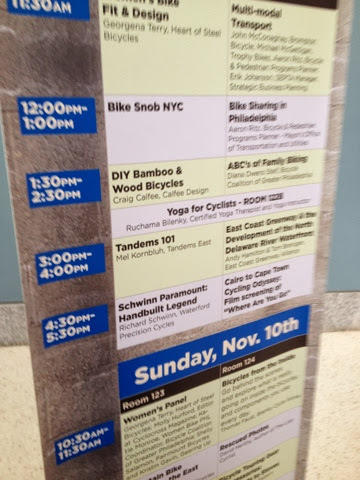 Right before our Kidical Mass ride in August I realized the Philly Bike Expo was a great way to remind the Philadelphia bike scene that family cycling is "here" and alive. 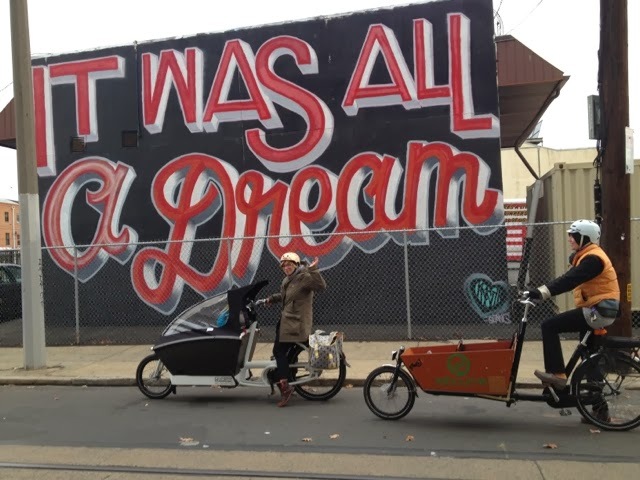 Families cycling is not just in places like Amsterdam or Portland but right here in Philly! Most people probably think Philadelphia cyclist and picture hipsters on fix gears or cyclists in lycra climbing the Manayunk Wall. But hey here we are just a group of parents dressed like we normally do who use bikes as both transportation and fun with our kids. 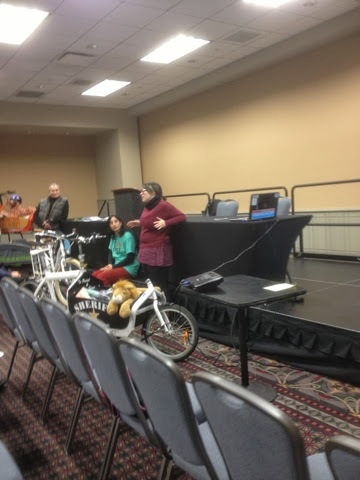 Additionally, I knew Diana from the Bike Coalition planned on doing another round of ABCs of Family Biking and I had volunteered to talk about Kidical Mass and our efforts to bring safe streets and group rides to Philly. 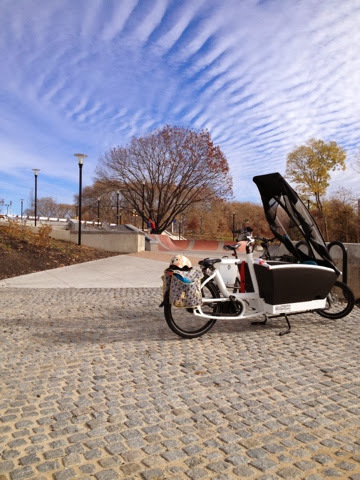 This past Saturday Husband, kids and I rode to Fitler Square for a group ride to the Philadelphia Convention Center and the Philly Bike Expo. We had about 25 people overall including kids and adults. 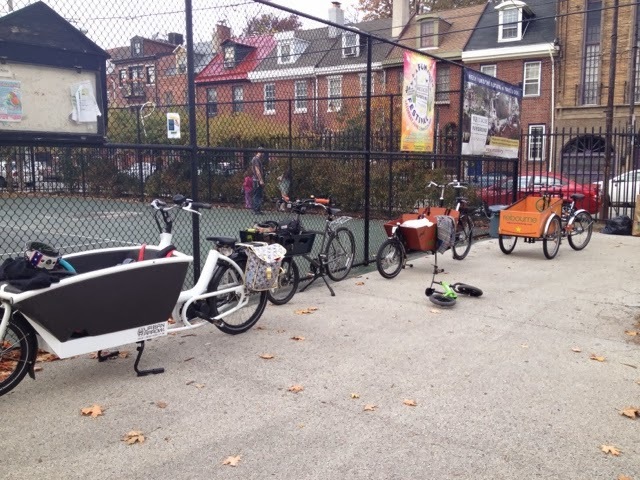 Small group, but what a great showing of different cargo bikes. 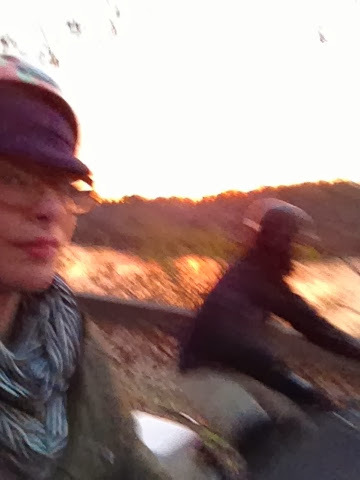 Please see this fantastic video my husband shot of us leaving the park. 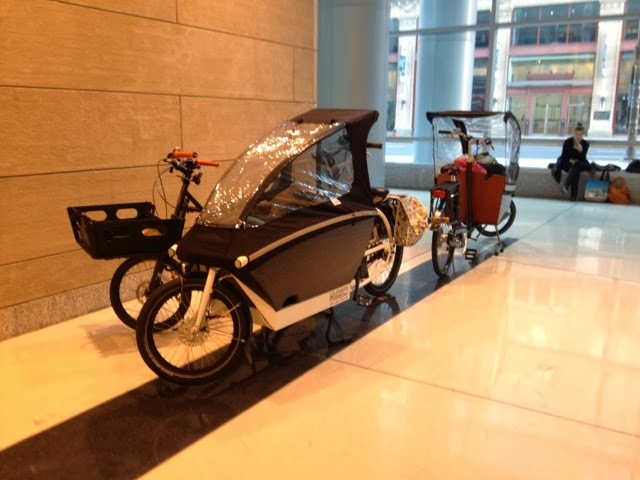 Note Marni's handmade bakfiets.nl cover, the tricked out Haley Trike & the crowd favorite the "Bike Doozer". Nutcase Helmets also came by with snacks and bracelets for everyone. They were so very sweet to us. 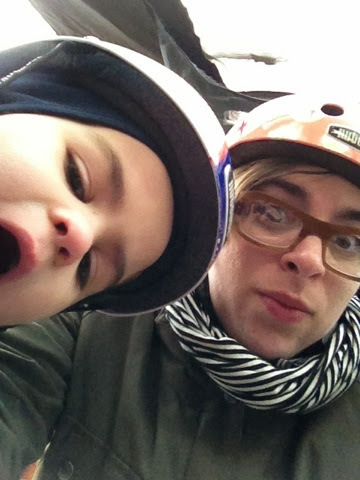 Clearly M and I both wear nutcase helmets so we love them at the least! 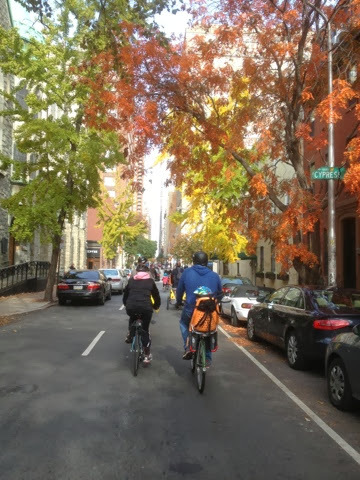 The ride was 1.5 miles and pretty straight forward, we rode mostly on bike lane less 18th Street and Race Street so we just took the lane. With so many big bikes the lane was easy to take. We rolled up and into the convention and BOY did we make a splash. 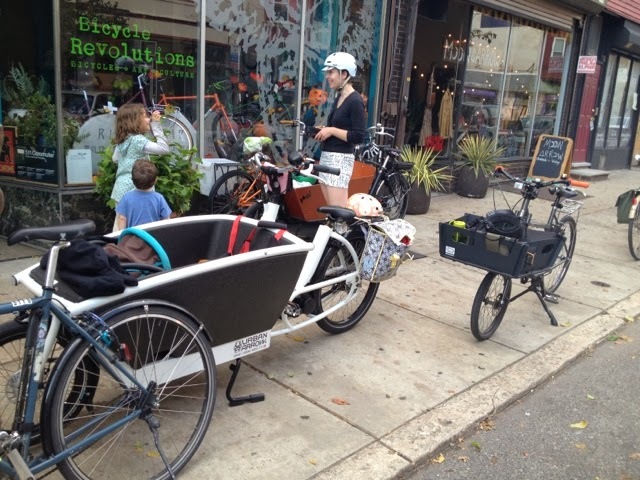 A splash of people all staring at our crazy cargo bike gang. 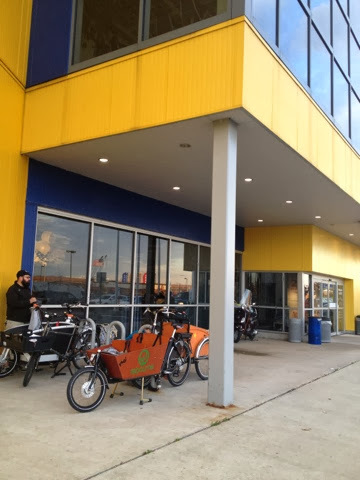 We overwhelmed the indoor bike parking and were asked to park neatly on the side. For about twenty minutes upon entry I actually couldn't get away from my bike. People were taking pictures of the bike while M was passed out just sleeping in it. 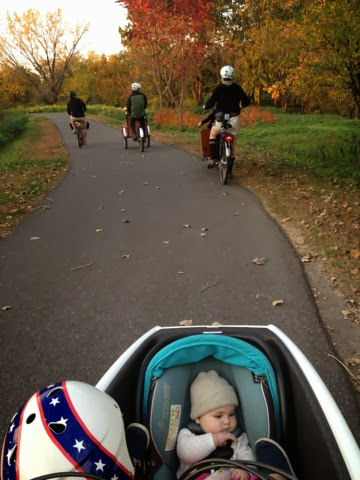 What a way to "sell" people on family biking here is my kid fast asleep. 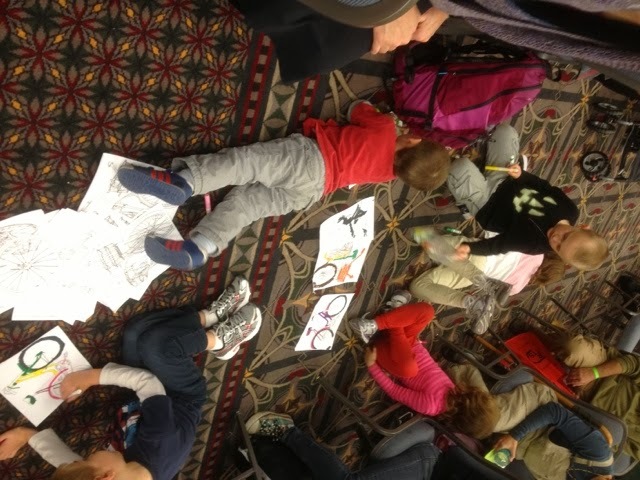 I happily answered as many questions as I could and then dashed away to see the expo before ABCs. I have absolutely no pics of the inside of the expo. Not really sure why I didn't take any pictures but it was set up really well. There was a great mix of local and national bike people. A little bit of everything as the expo promotes, frame builders, artisans, bike shops and more. Both small business and big business were inside. 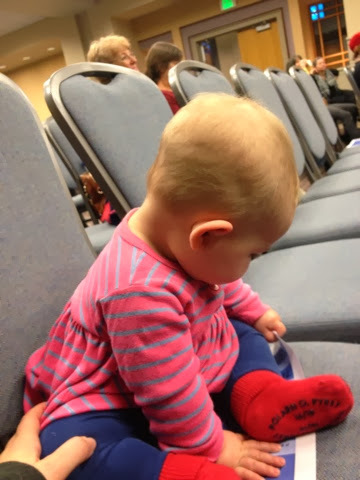 After exploration I made my way over to the seminar rooms for ABCs. I won't dwell too much on the actual seminar I will say that we live in a fear obsessed culture. 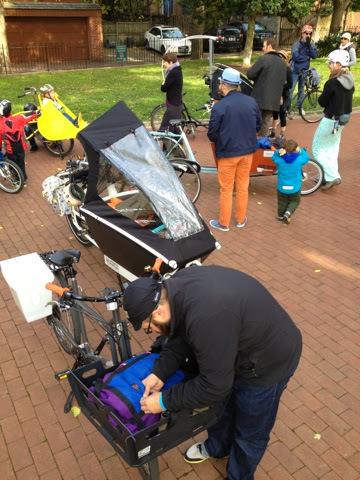 I felt like a lot of technical advice may have seemed overwhelming to the people there trying to figure out how to bike with kids. 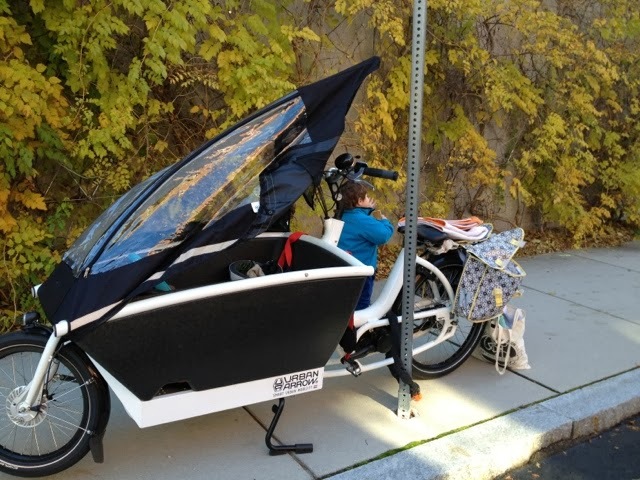 My personal take away goal is to just get more families biking and help change the face of who you are "sharing" the street with. 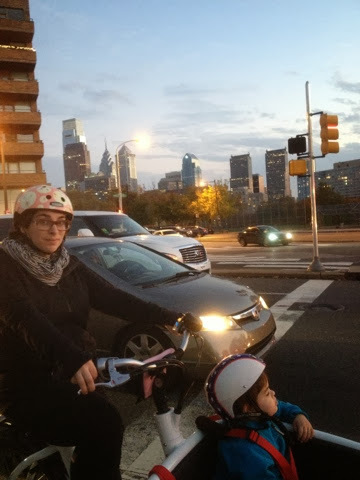 Kidical Mass Philly's, aka Marni and I's biggest take away is we need to make more opportunities to talk about family biking both on a local and national level. 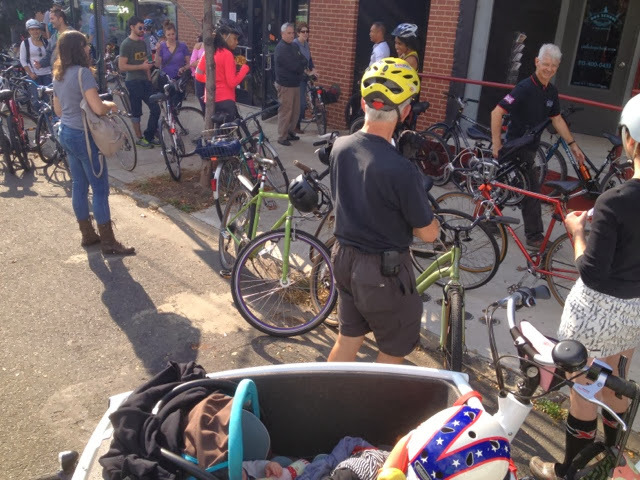 We are planning to host a KMPHL open house of sorts this winter for families to talk about family biking and try out bikes at a local shop. Stay tuned for more information. Where to begin? Well Friday. I will start with Friday. 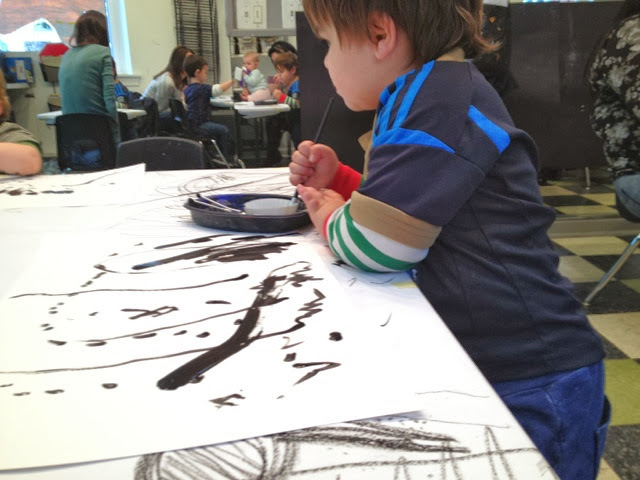 Friday morning I signed M up for a toddler art class in Fairmount. So this started our marathon biking weekend. Ten miles round trip. 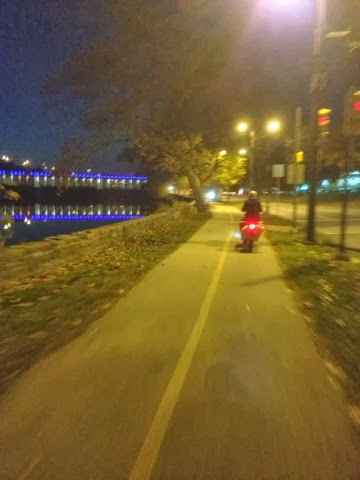 Solo bike trips into and out of Center City can be tricky but this one went off well. Bike parking down at the center was a little nutty as it appears garbage day is Friday so lots of cans and recycling bins on the ground. Found a good spot behind the Art Museum's annex. And headed home. The crosswinds are getting gnarly this time of year. 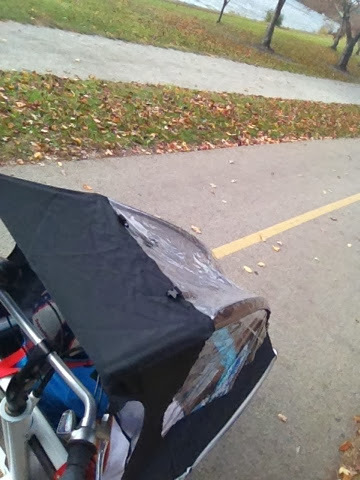 And headwinds are fun too. I found myself ducking behind the hood for some wind breaks. But the views are unbeatable. Perfect fall foliage last week. I assume trees will be more bare this week. We got home and M refused to leave his toasty warm bike, I don't blame him. 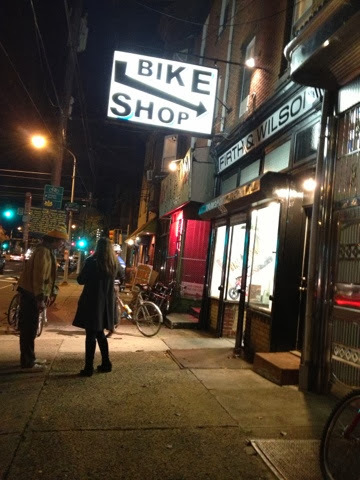 My parents came to watch the kids that night so we could bike back to the city for our anniversary dinner and then swing by the Firth & Wilson vendor bender for the Philly Bike Expo. Mama broke out the elusive pink whip that hasn't seen much action since I was 30 something odd weeks pregnant. Look at that line of traffic. Bike paths for the win! We had an awesome lobster dinner at Route 6. So good (plus half price lobsters for November!!) and headed to the party. 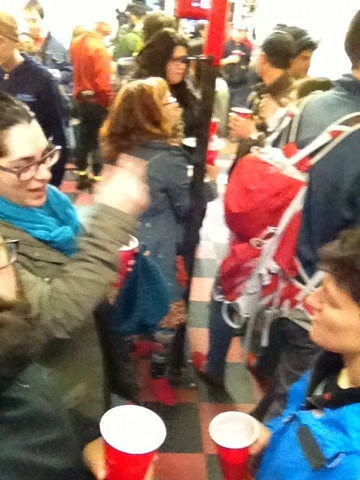 Everyone we spoke to agreed the one bike shop who can throw a party is totally the guys at Firth&Wilson. We grabbed the pink bike and halsted and headed home early though as let's be real we had a Kidical Mass ride tomorrow and no one wants to ride with kids hung over. 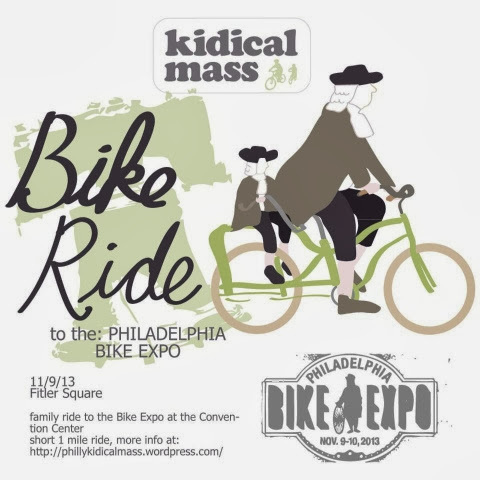 Just a quick reminder that Kidical Mass will ride to the Philly Bike Expo this Saturday. We leave at 11:30 am from Fitler Square. The ride is 1.5 miles. Please see kidicalmassPHL.org for all the details. 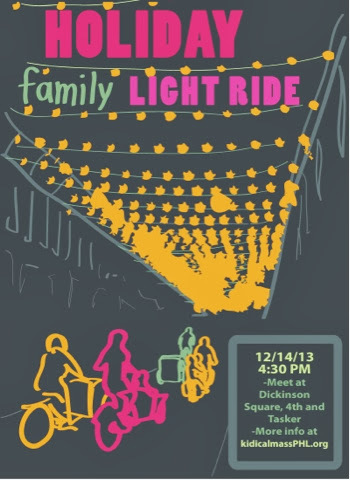 PS mark your calendar for our South Philly Holiday Light Ride! Now don't get me wrong we did have a lot of fun on Saturday. We stayed for four stops on the shop crawl ride. There was donuts to be had and leftover Halloween candy. We ditched out after Bicycle Revolutions to go grocery shopping. But turns out we decided to do the local park with the Rebourne Crew and then Ikea! 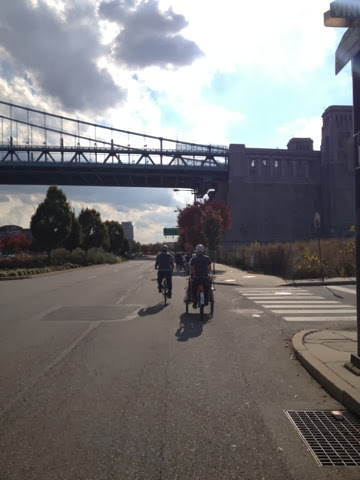 We got to ride the Delaware River Trail and saw the new greenway. 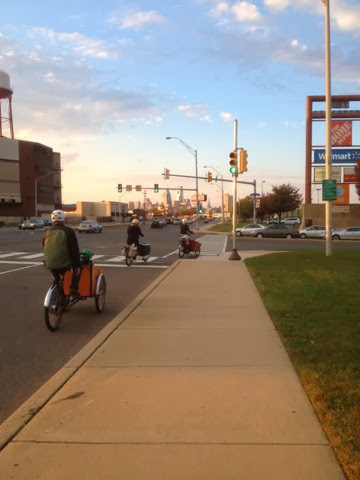 The river trail drops you off in the South Philly Walmart parking lot. Lots of stray cats and cars! 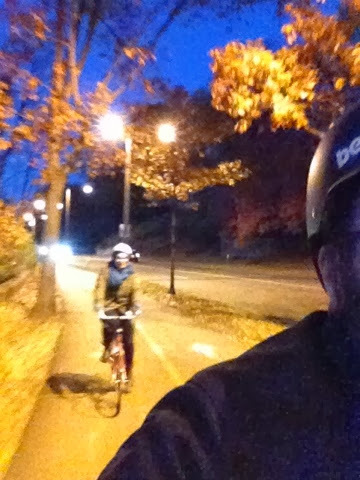 We also rode home along Kelly Drive at night. Peaceful. I read the book "Bicycle Tribes" last year. In summary, it was a book highlighting and essentially poking fun at different types of cyclist groups in the States. No group was left unwritten about, well almost no group. 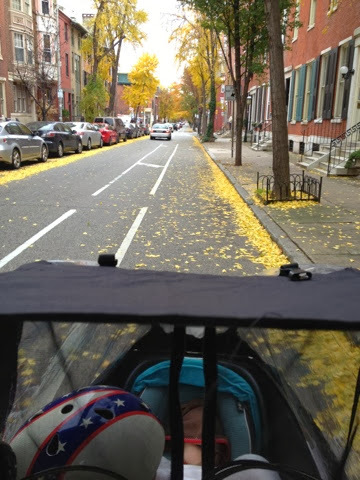 There is us parent bikers left out. But i'm not surprised. In a world where we try to teach green living and healthy lifestyle to our children Family bicycling which fits both is still a fringe activity. I feel like the past couple of days this topic has come to head for me. I saw first hand the all to common exclusive nature of people who bike in the states plus reading the comments about Emily Finch and her missing bakfiets. When you become a new parent every one has an opinion on how you choose to raise your child. Comments about how your kid must be cold because they aren't wearing enough sweaters or socks are heard in supermarkets across America. In a bike we hear a lot worst. At an intersection when a window goes down I am often cringing. What is this person about to say to me? 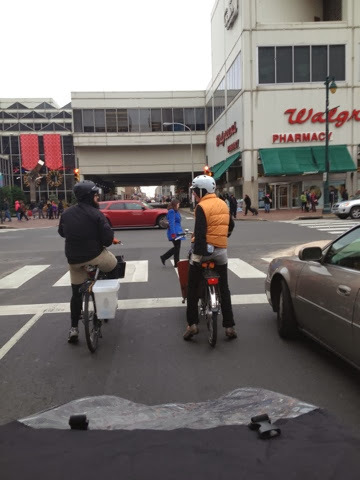 Last Saturday a man yelled at me and my husband for not being on the sidewalk (illegal) and asked "what are we doing" well trying to make a left as we signaled but you decided to go around us and make right in front of us. The conversation didn't go that calmly. 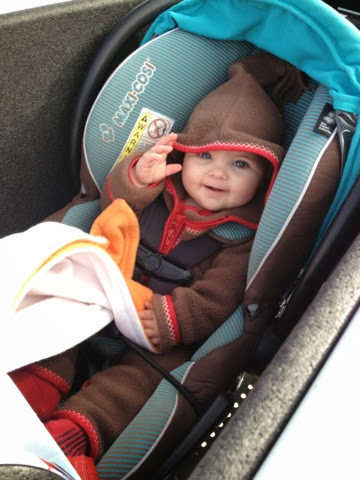 Or while biking back that Saturday night a black SUV of guys yelling across Spring Garden at me "baby mobile". I ignored them and laughed, but really what is with the harassment? 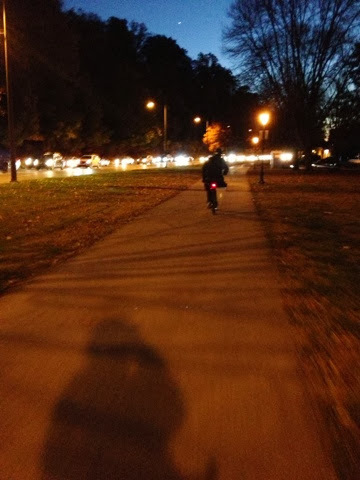 But this post isn't about car drivers who think I am some idiot biking my kids around. This post is about other people who like to bike too thinking that. 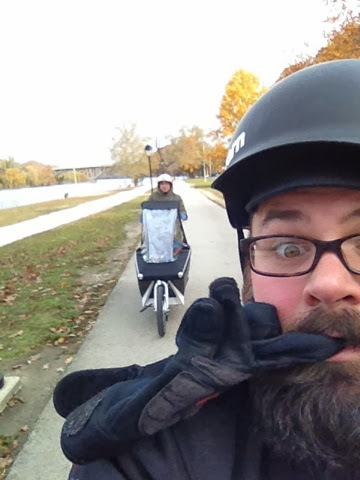 Us parent bicyclists are probably the most inclusive group, we just want to increase our ranks, happily becoming spokesmodels for one less minivan and one more cargo bike or trailer to any person on the street who asks. Hoping for one more family to travel by bike, for the taboo we are putting are kids in mortal danger or that we are spending too much money on a "toy" or that we are all dirty hippies might slowly disappear. However other cyclists? This summer one "roadie" got up next to me to yell to his friend that I had a "baby launcher". What? Thanks for implying I'm putting my child in danger. I'm not recently postpartum are anything with lost of emotions. That cyclist then went on and blocked the only curb cut to the path while he took a break. Hi not everyone one can just hop up the curb. 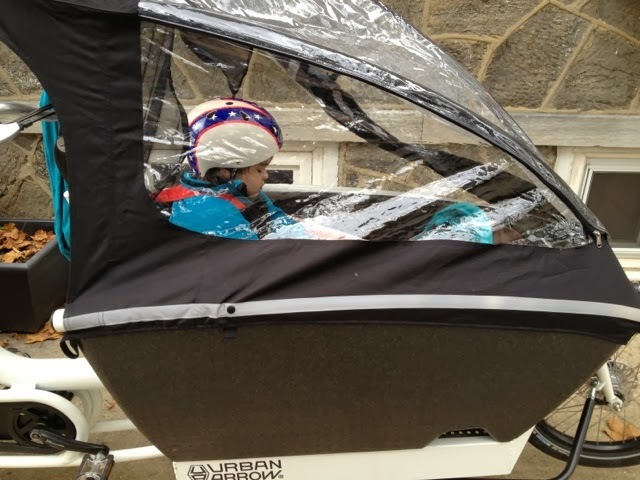 A parent posted recently on Kidical Mass Philly's Facebook how a local bike shop berated her for wanting to use a front seat on her bike. 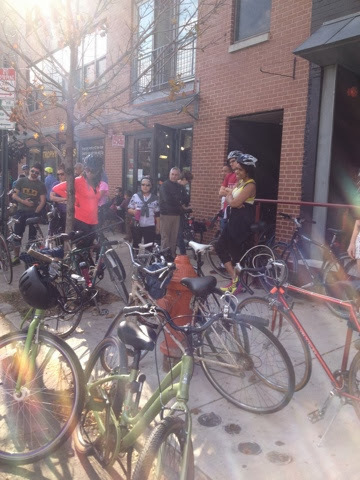 This past Saturday was a "Take Your Time Group Bike Ride." Usually these rides are during the week and women only (and usually much smaller then this one). Hard for me too do with the kids and all. So the group all are welcomed weekend ride was a nice chance to ride with another slow group besides Kidical Mass. But honestly the riders on the ride left a sour taste in my and my fellow mom's mouths on the ride. 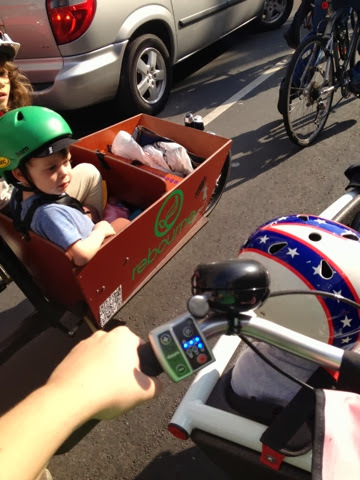 Ironically, "Kidical Mass DC" had tweeted earlier on Saturday a similar feeling to what we felt on the ride. 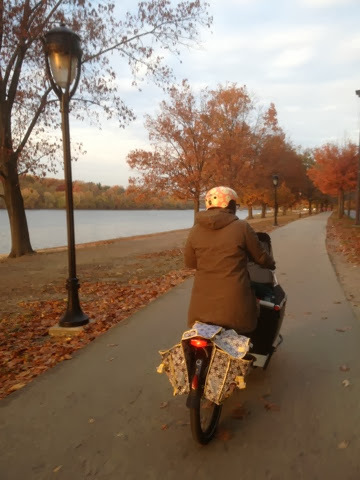 She was at a conference and had to "issue" the memo that not everyone rides the same way you do. Not everyone has the same burdens or terrain. A man on our ride so kindly made a comment about my pedal assist as parents in the Netherlands don't need them yadda yadda yadda. 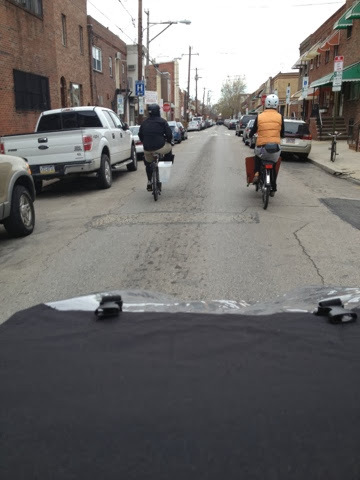 Well I'm climbing hills in Manayunk sir and on Saturday for instance I am biking 22 miles with two kids in tow. So maybe you could say wow that is great what you are doing without implying I am some how less of a bike rider. (Also don't talk down to me because I don't know the exact kind of drive train, I'm just here to ride a bike). Riders who said is that safe? Are you implying I'm not safe with my kids. Thanks. While Kidical Mass tries to get our weakest and slowest riders to ride up front helping to set the pace. I found riders leaving an older lady who was on the ride way behind. Maybe it is a motherly thing but it made me worried as this is the rider that a group ride helps protect. My KM co-orgnaizer and fellow mom on the ride's husband stopped at one point to help an older man with a bad tire. Again this is who a group ride should protect. And although I am happy to protect my own weakest passengers. It would be nice if fellow rides on the ride to understand it takes a moment to accelerate on my bike or my turn is going to be way wider or slower. Instead the looks of UGH were shown. So the question? 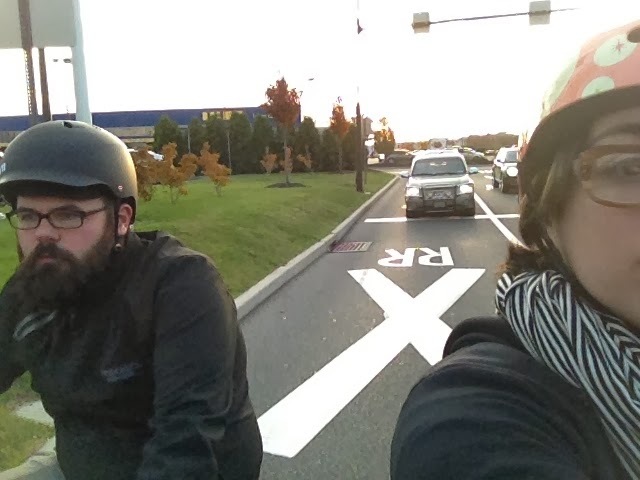 How do we make bike riders more understanding that other people ride differently. That pedal assist isn't a cheat. That going slow is just as great as going fast. That we should encourage and protect the weakest not leave them alone. Group rides are after all social. Not sure I have the answer to the problem?